The Cosco’s container ship Xin Fei Zhou allided with stone wall at the new dock Agua Clara on the Atlantic side of the expanded Panama Canal. The vessel was proceeding in western direction, but hit the stone wall and suffered sufficient damages. 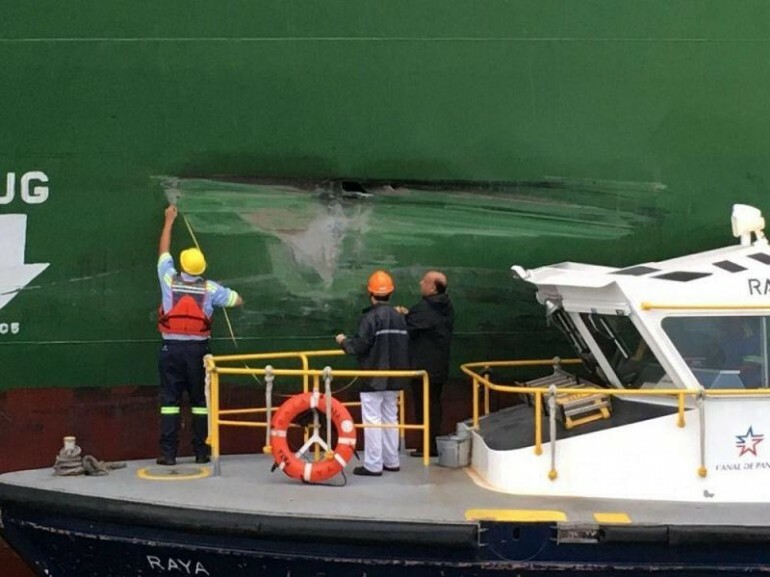 The Panama Canal Authority is investigating the incident and has said this is the first accident to have happened along the new locks. After the allision, the vessel suffered several meters long gash above waterline, but remained afloat and proceeded by own power. The Cosco’s container ship Xin Fei Zhou will be detained for repair and inspection until return in operations. Fortunately there were no injured people and water pollution. The new dock Agua Clara suffered slight damages and remained operational without interruption of traffic. The inspectors followed survey of the dock and estimated that no need of repairs and damages are surface only. The container ship Xin Fei Zhou (IMO: 9337937) has overall length of 335.00 m, moulded beam of 42.80 m and maximum draft of 10.50 m. The deadweight of the vessel is 102,379 DWT and the gross tonnage is 90,757 GRT. The container carrier was built in 2008 by Hudong Zhonghua Shipbuilding Group in China. The owner and operator of the container ship Xin Fei Zhou is the new formed China Shipping Container Lines after merger of Cosco and China Shipping.